Your firearms are a huge investment. Protect that investment with a heavy duty gun safe you can count on! At Old Glory Guns & Ammo, we’ve expanded with gun safes from dealers like Browning, Eastern Security, Fort Knox, and others. We have a great selection of these safes in our showroom so you can really get a feel for the different sizes and features available. Of course, the staff at Old Glory is knowledgeable and are ready to help you pick out the right safe for your situation! 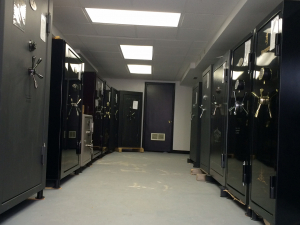 Upon visiting the first thing you’ll notice is that these are heavy duty safes and many have high end features such as high gauge steel construction, continuous welding, locking bolts and strong fire ratings. These are not the light duty safes you might see in some big box stores. It’s really something to see these in person so you can not only appreciate their grand size and ruggedness, but also how easily the doors and locking mechanisms operate. Stop by and see us for a tour – we can help your pick out the safe is right for you, and if needed we can also help you get it home!